Tabletop RPGs are undergoing a bit of a renaissance of late with Dungeons and Dragons and Pathfinder both gathering an ever expanding audience. Even Dragon Age has a pen and paper variant. So, it comes as little surprise that a developer has sought to bridge the gap between video game RPG and the pen and paper variety. 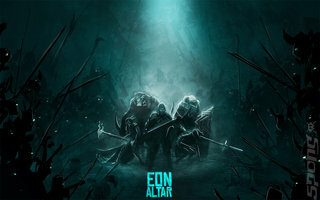 That developer is Flying Helmet (see our interview with the founder member, Edward Douglas, here) and that developer has created Eon Altar, a multiplayer focused RPG that can be played either locally or online. The game takes place in village of Tarnum in the Kingdom of Grey. This village has a cave that descends deep into the earth where many treasures can be found. It is down this cave players delve into in attempt to gain fame and, more importantly fortune. 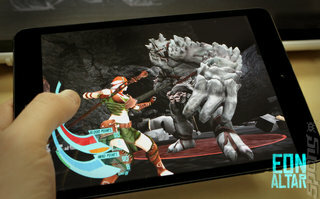 Two to five players can play Eon Altar and all interact with the game via two screens: one communal central screen that is typically a touch pad tablet device and the other another tablet or smart phone device. All of the group interaction with the world is managed via the communal screen, where players can move their characters into various locations in the game world. 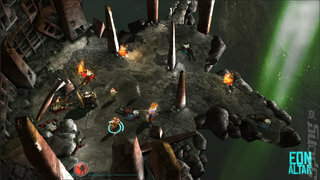 Once players engage in combat the action switches to their own devices. From their they select opponents and methods of attack. Combat is dealt with via dice rolls that appear on the players device. They then shake their device and the dice jump from their screen to the communal one. A successful hit is a five or more on a six-sided dice, with multiple sixes resulting in critical strikes. Defence is handled in a similar way and enemies do counter the attacks with defensive rolls. Once the combat is resolved the damage is tallied up. and the combat continues onto the next player. The set up is based on the premise that people like to play pen and paper RPG games only don't want the hassle of having a vast library of books and hundreds of dice in order to play them. Eon Altar attempts to cater to that audience. With the game a relatively early development, the build being shown on the PAX East show floor was quite advanced. The graphical assets were impressive as were the animations and lighting effects. There were however technical issues concerning connectivity, but that's hardly surprising considering the number of wireless devices that were present at the event. One of the interesting aspects of the game was the way in which it delivered narrative. At certain trigger points in the game a player's screen will display some text, which the player reads out or can simply let the game's narrator say. The next bit of dialogue is then displayed on the next player's device. As the game progresses items are dropped and then collected by the players. This is done in turn, thus preventing players from diving in and grabbing everything for themselves. Ability points are also earned, that can be spent on unlocking skills that strengthen the player character's abilities. There are a pre-set selection of characters that are made available, all having the standard character tropes of melee->healer->damage dealer. While it is possible to alter a character's abilities from one of these tropes to another, they will not be as proficient as their base type. It is not known when Eon Altar will eventually appear, but from what was shown the game does have the potential to bridge the gap between table top and video game and for that alone it should be applauded. 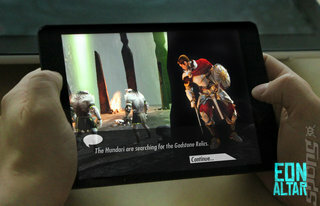 Eon Altar is being ported to Windows 7, Windows 8 Tablet, Windows 8 Smartphone, iOS & Android.